The United States’ honey bee population has been in steep decline over the last decade or more, and a special addition to Georgia Regents University is teaching students how to be part of the solution . 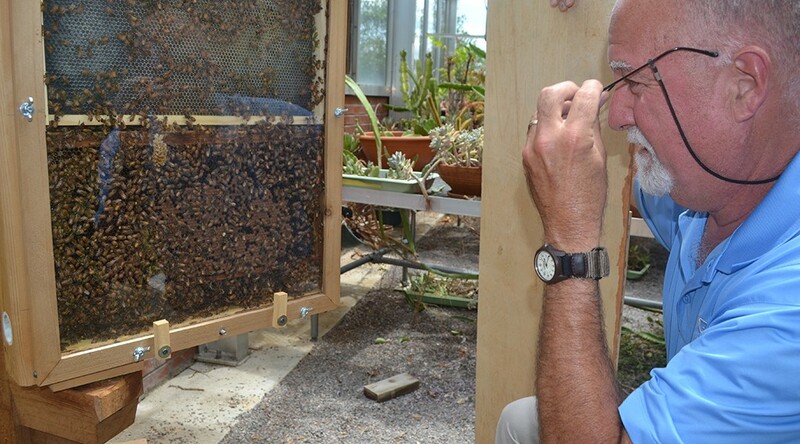 In April, Facilities Management Maintenance Supervisor Tim Dobbs installed an observation bee hive in the Shetfall-Cleckley Greenhouse at GRU’s Summerville Campus in collaboration with Biology Professor Donna Wear with the hope that students learn and see firsthand how integral the honey bee is to the earth’s ecological system. This spring, Professor Wear’s Evolutionary Biology class was the first group to visit the observation hive. “Honey bees are fascinating social organisms from both an ecological and evolutionary perspective. Pollinators are crucial to our global production of food. In fact, about one-third of the human diet comes from insect-pollinated plants, and the honey bee is responsible for 80 percent of that pollination, according to the U.S. Department of Agriculture,” Professor Wear said. The insect’s vital role in food production is why their disappearance is so concerning. Just last week, the White House outlined its strategy to strengthen the nation’s struggling honey bee and monarch butterfly populations, calling for expanding the acreage devoted to the flowers crucial to the bees’ and butterflies’ survival. Scientists have yet to isolate a single cause of the honey bees’ demise, called colony collapse disorder, but a certain type of pesticides introduced in the 1990s has been known to interfere with a bee’s homing ability. Dobbs built the Greenhouse’s observation hive himself with a blueprint purchased online. He then stocked the hive with approximately 10,000 bees and checks it once or twice a week. Observers can easily see the worker bees and drone bees performing their respective duties in the hive and, if you’re lucky, watch the queen lay her eggs. Dobbs has been a bee enthusiast since he was a young boy, and built his first hive 30 years ago. “Mr. Dobbs has been a beekeeper for many years, and even he has witnessed bee behavior in the observation hive that he had never before been able to observe. The observation hive provides a wonderful teaching and learning opportunity for students of all ages, who need to be reminded of the ecological processes that feed us,” Professor Wear said.